Anchor is expanding the world of podcasting by empowering independent creators all over the world. In fact, one out of every three new podcasts are now powered by Anchor — that’s the largest market share of new shows from any company in podcasting today, and more than double that of some platforms that have been around for over a decade (according to research from podcast analytics firm Chartable). 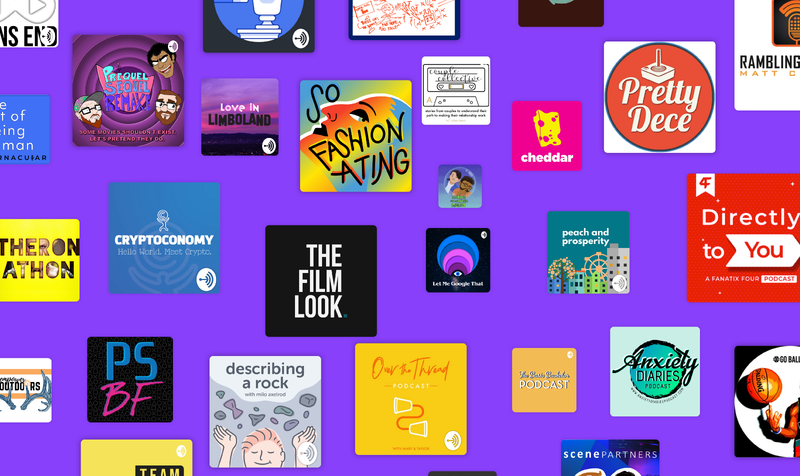 As the market grows and more voices are heard, it’s time every creator, regardless of audience size, industry connections or experience level, has an easy way to monetize their podcasts. Our mission has always meant more than just enabling people to create — we’ve also always wanted to help people make money from their podcasts. Previously, this was a real challenge for most creators: Unless you caught the attention of a podcast network who could sell your show to advertisers, your options were limited. For independent podcasters, there was no clear path to getting paid for your work. That’s why we’re eliminating those challenges with the launch of Listener Support, which lets your listeners opt into automatic monthly payments that go right into your pocket. 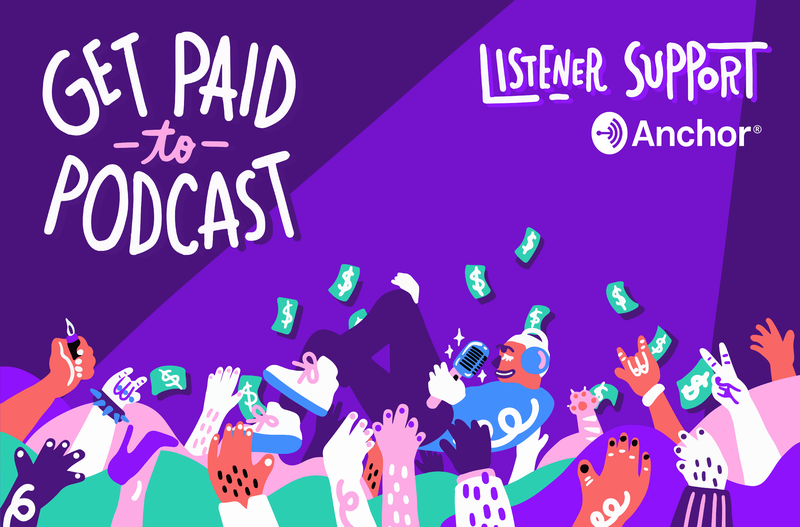 We believe this is the very core of monetizing creative content: Listeners are able to directly fund work they find meaningful, and you receive support for the sweat you’ve put into that work (your podcast). With the tap of a button, any Anchor creator in the U.S. can now activate Listener Support from your dashboard at anchor.fm (on desktop and mobile browsers). 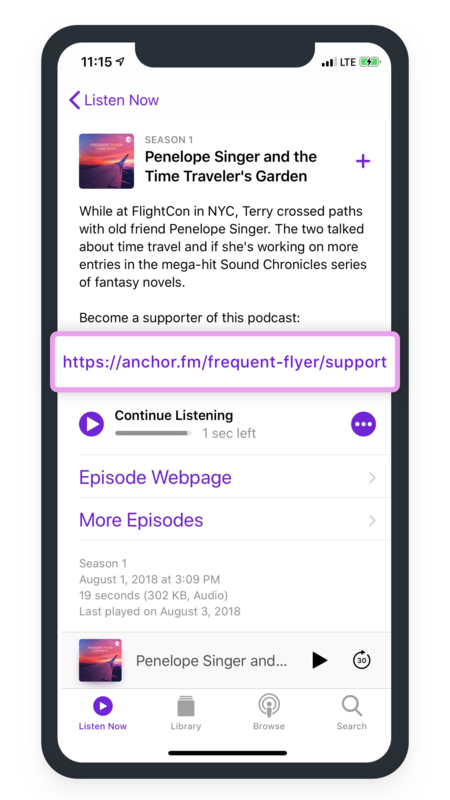 This adds a Listener Support button to your public Anchor profile along with a link in your show notes on every app or website where your podcast is available, so your listeners can sign up to support you from anywhere, even if they don’t have an Anchor account. Your listeners can support you from the show notes in any app or website where your podcast is available, including Apple Podcasts. Pro tip: make sure to ask your listeners to support you in the audio of your podcast episodes, too! Any time a listener clicks through these links, they’ll be presented with the option to sign up to make recurring, automatic monthly payments to support your podcast. They’ll choose one of three support tiers: $0.99, $4.99, or $9.99. Then they enter payment info, and their charge is immediately processed by Stripe (the company we use to help process payments). If they’re on an iOS device or a Mac with a Touch Bar, they can pay with Apple Pay. On Android or in any Chrome browser, they can pay with Google Pay. It’s insanely quick and easy, from anywhere. Once your listeners start signing up, you can see exactly who is supporting you so you can shout them out in your podcast (or anything else you want to do to show your appreciation). When you’re ready to collect your money, just tap the Cash Out button in your Anchor dashboard to get paid. Anchor sends the money right away; no need to wait until the end of the month. We know how important it is for independent creators to get paid quickly, so we made sure cashing out is a breeze. We’re also committed to enabling you to generate revenue with Anchor using as few fees as possible to keep payments functioning. Anchor takes an industry-lowest 4.5% fee, alongside Stripe’s standard 5% + $0.10 processing fee, from each transaction with your supporters. There’s also a $0.25 Stripe payout fee when you cash out the money to your bank account. You, as the creator, take all the rest. As an example, if you have 10 supporters who’ve each pledged $9.99, you end up with $89.16 in your bank account for that month. For more information on our 100% transparent fee structure, check out our Listener Support guide. Some amazing independent creators are already taking advantage of Listener Support to generate new revenue from their podcast. Check out Good Hustle, Over the Thread, Sweet Husbands, or That’s Weird for some examples of how these podcasts are using the feature and introducing it to their listeners. Podcasts can come in all shapes and sizes, from critical news delivered at just the right time, to compelling fictional narratives, or even beautiful works of art. Whatever the message, creators pour their hearts and souls into making podcasts, and we believe that message can be both powerful, and valuable. 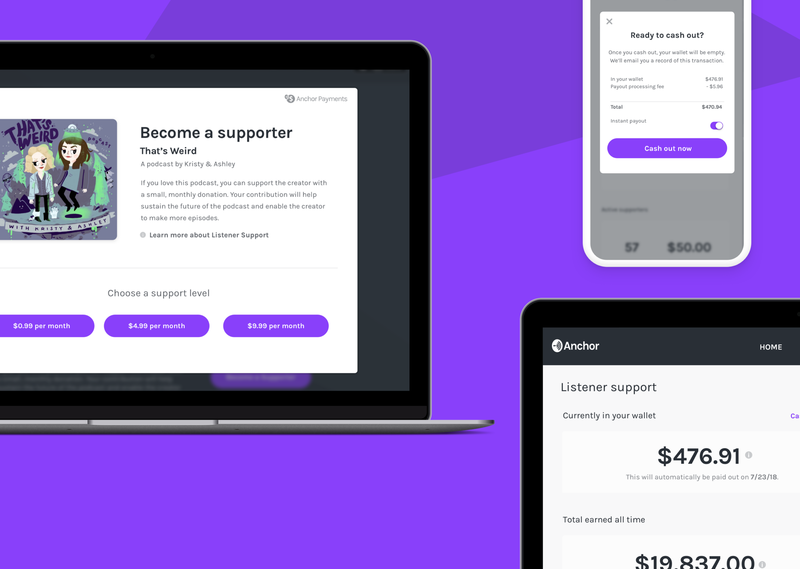 We can’t wait for you to give Anchor Listener Support a try. Not making a podcast yet? Check out our handy How to Start a Podcast guide for tips and tricks on how to make something awesome with Anchor. And as always, we’d love to hear your feedback, via email or on Twitter.